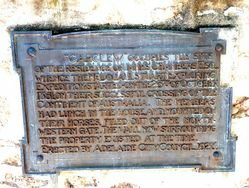 A plaque commemorates the starting point of John McDouall Stuart`s expedition of the south-north crossing of Australia in 1861. The plaque is mounted on the original wall of the house of James Chambers from where the expedition started. The site is now occupied by "Carclew." " CARCLEW" OCCUPIES THE SITE OF THE RESIDENCE OF JAMES CHAMBERS ESQ. WHENCE THE MCDOUALL STUART EXPLORING EXPEDITION STARTED ON THE 25tH OF OCTOBER 1861, ON THEIR SUCCESSFUL CROSSING OF THE CONTINENT OF AUSTRALIA. 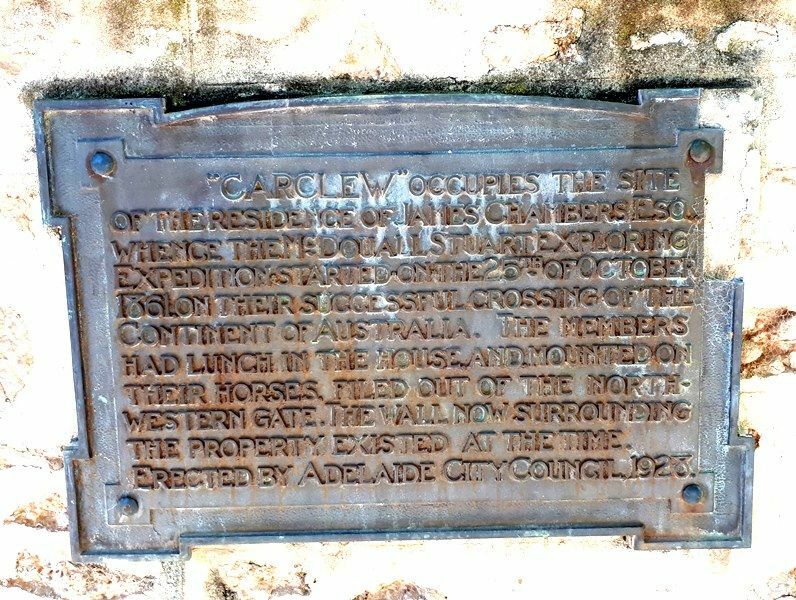 THE MEMBERS HAD LUNCH IN THE HOUSE AND MOUNTED ON THEIR HORSES FILED OUT OF THE NORTH - WESTERN GATE. THE WALL NOW SURROUNDING THE PROPERTY EXISTED AT THE TIME. ERECTED BY THE ADELAIDE CITY COUNCIL, 1928. 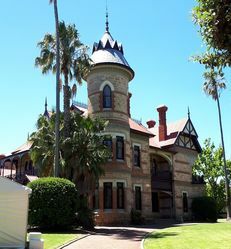 This prominent eclectic High-Victorian building, originally called Stalheim, was built in 1901 by Hugh Robert Dixson, a State MP. The house was purchased by the Bonython family in 1908 which renamed the house Carclew after a Cornish house once owned by the family in Cornwall. 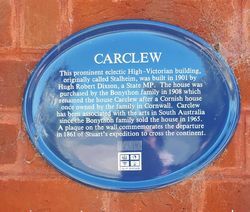 Carclew has been associated with the arts in South Australia since the Bonython family sold the house in 1965. A plaque on the wall commemorates the departure in 1861 of Stuart`s expedition to cross the continent.